Have you heard of the Awkward Years Project yet? If you haven't... you must've been hiding under a rock for the past week. 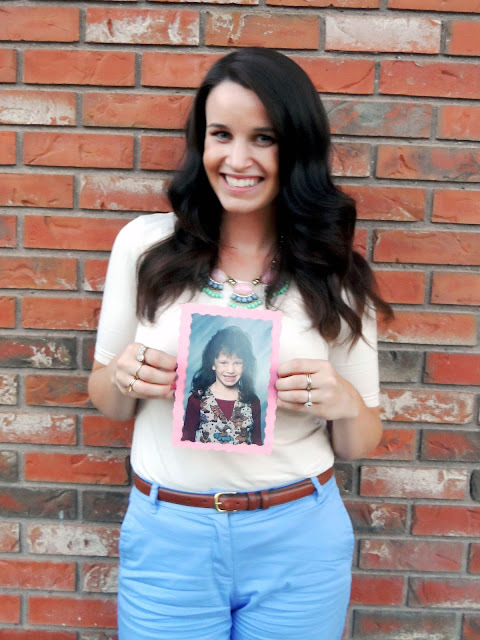 The Awkward Years Project, created by Merilee has been all over every website from Yahoo to KSL. I found out about the project via Yahoo and was thrilled to see that this idea was thought of by a fellow SLC resident! I love seeing people from my home state of Utah succeed and make it big! This idea is beyond great... She collects photographs of individuals holding some of their awkward photos from their childhood. I think this is such a great idea because when you're in junior high and high school, everyone thinks that that awkward time of life is going to last FOREVER. and it doesn't. It's so inspiring to see how people have grown up, chased their dreams, and overcome obstacles that they once thought would never end. I couldn't help but jump on the bandwagon with this one. I emailed Merilee the moment I heard about the project online and am grateful for her willingness to feature me so quickly! Be sure to check out her site! You may have to scroll down a bit to see my photo, I'm not quite sure how many people she is adding per day. I'm currently 5 people from the top! Thank you for stopping by! Great blog! I am your new follower via GFC, hope you will do the same. Following you back! thank you for stopping by! That is such a neat idea! I think I would like to join in! I have gone a looooong way from what I was and hoped to be when I was a kid! I feel the exact same way! Be sure to check out her website, and enter your own photo!! It's On for Comic Con. Pisa + Florence: Italy MUST-DOs! Rome if you want to, Rome around the world.